This really helps my pain level. With this I dont need as much of my NSAID! This CuraPro 750 mg by EuroMedica works well to lower inflammation . Doctor recommended I continue using the 750 after a noticieable improvement in lab work.. I used CuraPro 750 mg by EuroMedica, on advice of my chiropractor, after shoulder surgery. With the position instruction from the PT and this, I was able to not take any pain meds. 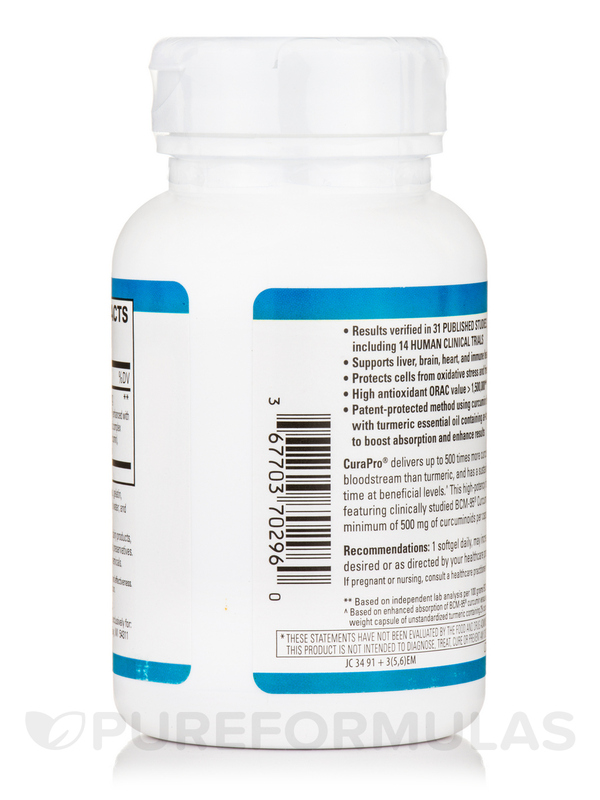 CuraPro® Softgels from EuroMedica may support brain‚ liver and immune health. 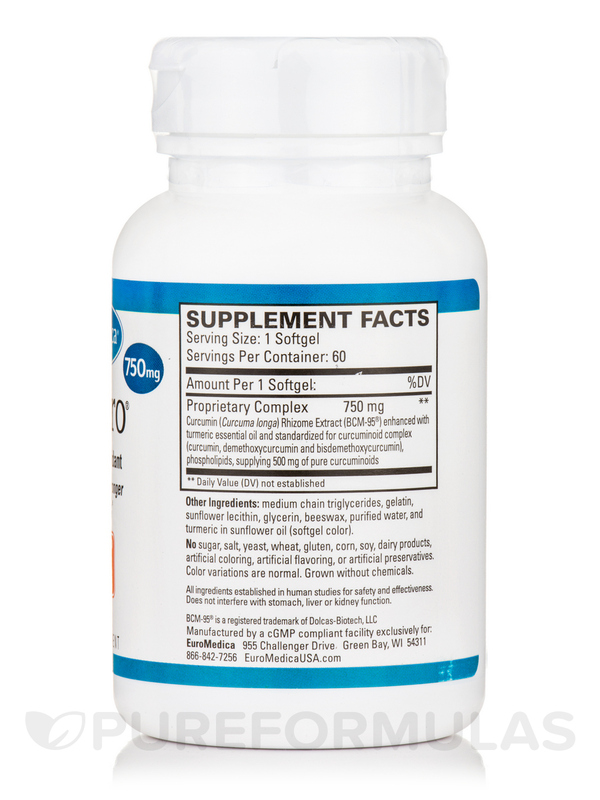 This supplement contains a blend of curcumin micronized rhyzome extract‚ phospholipids and turmeric essential oils. 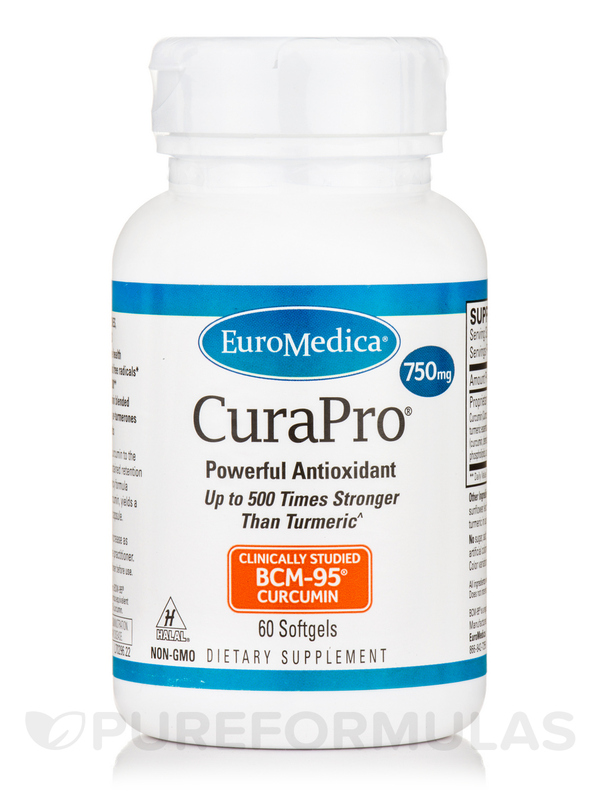 This formula from EuroMedica could be better absorbed than standard curcumin and has an 8 to 12 hour retention time at significant levels in the blood stream. 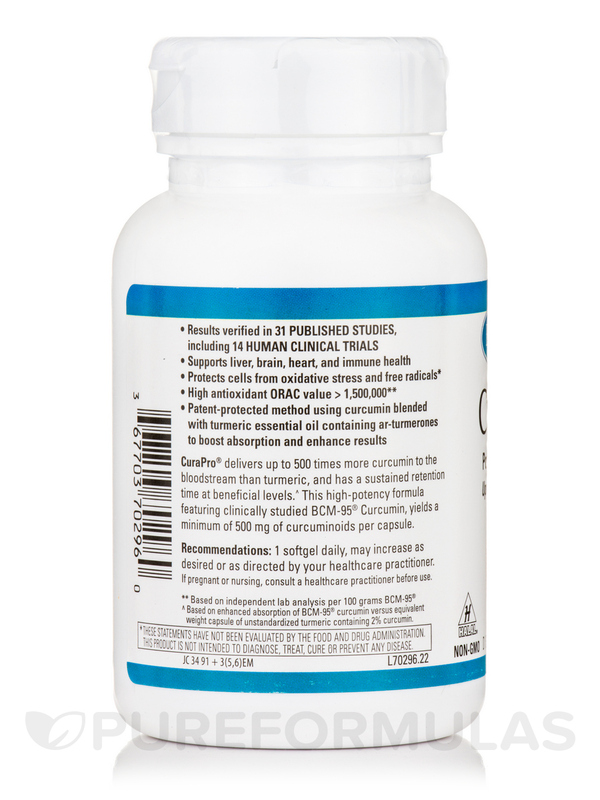 Curcumin is derived from turmeric and may support brain‚ liver‚ heart and immune health. It is the main circuminoid of turmeric‚ a member of the ginger family. Curcumin could reduce pain and inflammation of joints. It also possesses antioxidant properties‚ so it could protect your cells from oxidative stress and harmful free radicals. This supplement is free from artificial colors or flavors‚ preservatives‚ sugar‚ salt‚ soy‚ wheat‚ yeast and gluten. Switch to CuraPro® Softgels from EuroMedica to improve your brain‚ liver and immune health. 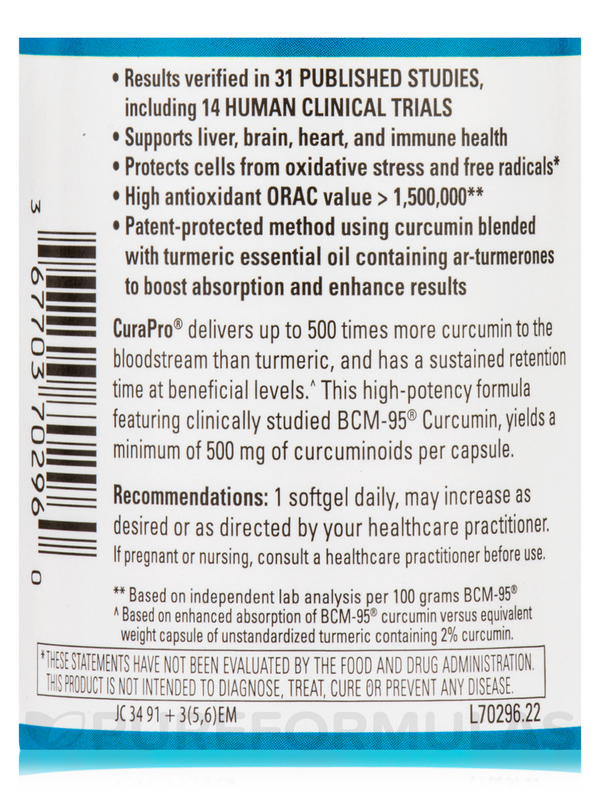 Curcumin (Curcuma longa) Rhizome Extract (BCM-95®) enhanced with turmeric essential oil and standardized for curcuminoid complex (curcumin‚ demethoxycurcumin and bisdemethoxycurcumin)‚ phospholipids‚ supplying 500 mg of pure curcuminoids. 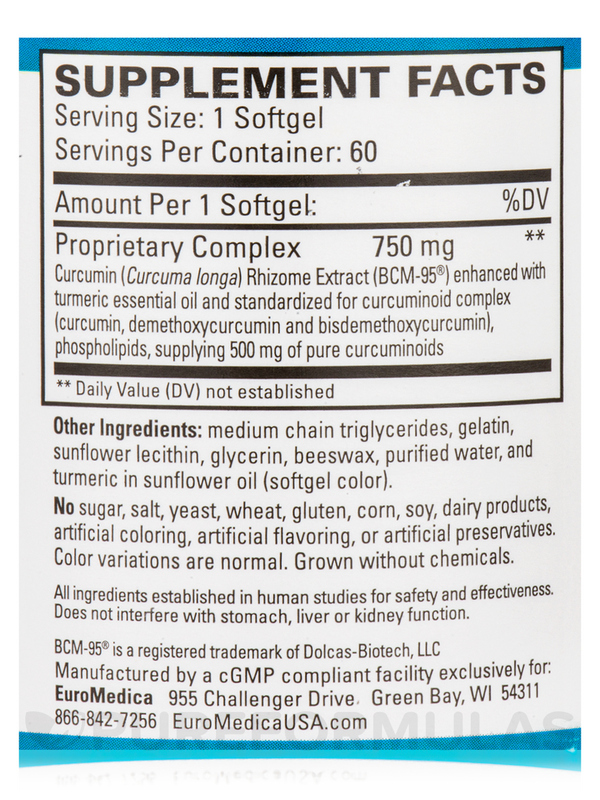 Other Ingredients: Medium chain triglycerides‚ gelatin‚ sunflower lecithin‚ glycerin‚ beeswax‚ purified water‚ and turmeric in sunflower oil (softgel color). No sugar‚ salt‚ yeast‚ wheat‚ gluten‚ corn‚ soy‚ dairy products‚ artificial coloring‚ artificial flavoring‚ artificial preservatives. Kosher / Non-GMO / Manufactured by a cGMP Compliant Facility. 1 softgel daily‚ may increase as desired or as directed by your healthcare practitioner. If pregnant or nursing‚ consult a healthcare practitioner before use. Notice: Color variations are normal. CuraPro 750 mg by EuroMedica has helped greatly with my RA pain. I was diagnosed with Rheumatoid Arthritis a little over a year ago and had initially responded very well to high doses of a prescription NSAID. Unfortunately, my pain and inflammation increased to the point that the NSAID was no longer alleviating my pain. I added CuraPro by EuroMedica to my regimen, I take it morning and night, and am nearing completely pain free. I also take Curaphen Extra Strength as needed for additional pain relief. I’ve tried taking a lower dose 375 mg, and have tried taking it only once per day, but have found the need to take it twice a day. I am so thankful for this great supplement! It has made a significant impact on my pain. I have recommended it to many others! It’s effectiveness and lack of side effects. Nothing, other than the fact that I need it! I purchased CuraPro 750 mg by EuroMedica for my brother who was a carpenter, then farmer, etc, working w/ his hands, and now retired. His wrists & hands were so bad, he was using ibuprofin WAY too much, up to 8 a day! I saw reviews on this product and bought it for him. After only 2 days he was working under my car to fix something w/little pain. He is so thrilled and is confident that this is something that ACTUALLY takes away the pain. This is truly a GOD Send for someone with arthritis or chronic pain! Yes -- a BIG PILL, but he deals with it. A relative recommended CuraPro by EuroMedica to me because it helped the inflammation she had with arthritis. I started taking it for the inflammation in and around my shoulder blades. Inflammation is gone! My chiro recommended CuraPro by EuroMedica to me tor back pain and mobility issues. It is fantastic. When I take it I feel way better than anything else I have tried. The softgels are a little big but they still go down very easily. Its natural and doesn't bother my stomach and it works really well!